San Francisco was the epicenter of U.S. counterculture in the late 1960s, and more than 50 years later visitors still get a primal sense of that era. 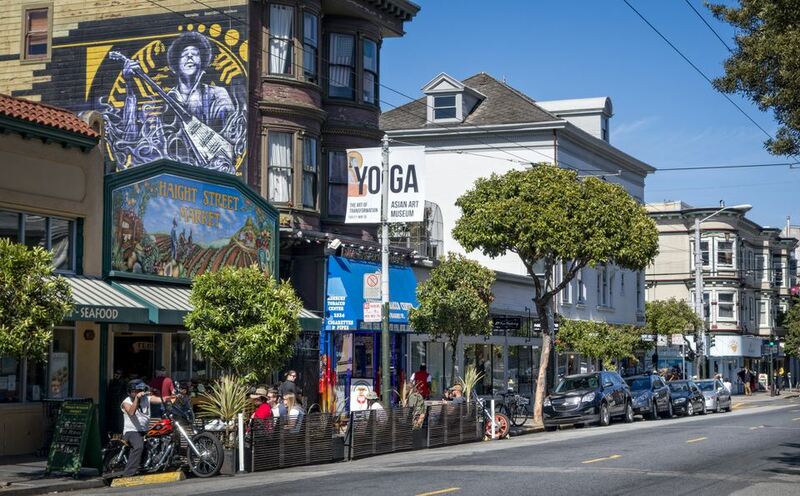 While the neighborhood has notably changed since The Summer of Love — with a few high-end boutiques such as John Fluevog and the occasional chain shop, like Ben & Jerry's — the Haight, as its locally known, still retains much of its hippie persona and open-minded feel. Smoke shops, Tibetan wares, and relatively cheap eats reign supreme along the community's main Haight Street stretch. Murals celebrating the neighborhood's distinct identity adorn many of its walls, adding bursts of color among the Haight's many Victorian houses. With so much to discover in Haight-Ashbury, where do you start? We've rounded up 10 things to do while you're in the area. It's a pilgrimage for Deadheads, hippies, and everyday visitors alike: the northwest intersection of Haight and Ashbury streets, where two perpendicular street signs have become a symbol for freedom, peace, love, and the entire '60s counterculture movement. This landmark corner shares space with the family-owned Haight-Ashbury T-Shirts, a perfect spot for picking up a souvenir Grateful Dead “dancing bears” tee or tie-dye. Put it on, flash a peace sign and get a trusty local to snap your pic. Even the Grateful Dead themselves have posed for photos here. Speaking of the Dead, the Haight is synonymous with this eclectic rock band and is ground zero for Deadheads, who come to walk in their footsteps, relive the music, and revel in San Francisco's Summer of Love memories. Two blocks north of Haight Street, Panhandle Park (or as locals call it, “The Panhandle”) was home to many free concerts during the Haight's glory days, including shows by Jefferson Airplane, Jimi Hendrix, and the Dead. In fact, the entire band lived in a converted boarding house at 710 Ashbury — a now privately-owned Victorian less than two blocks south of Haight Street, between Waller and Frederick streets — for much of the late '60s. It was here that the band worked on developing their signature sound, and stories about the house abound: including an infamous 1967 drug bust and a water balloon prank involving band-member Bob Weir and the SFPD. The house doesn't show much evidence of its storied past, but is definitely worth a moment of silence and a look. Buena Vista has long been a stop on the SF hippie circuit. It's San Francisco's oldest official park and undoubtedly among its steepest: a 37-acre expanse that climbs its way up a 575-foot-tall hillside from Haight Street just east of Central Avenue, resulting in great views of downtown and the Golden Gate Bridge. The many wide pathways and forested dirt trails offer a bit of reprieve from Haight Street's endless bustle. Marble tombstone fragments from the city's former Gold Rush-era graveyards (which have since been relocated to Colma, in the South Bay) line some of the walkways, and coyote sightings have been common in recent years. Opened in 1997 in an enormous 24,000-square-foot former bowling alley, Amoeba Records brought a new wave of music to a neighborhood already steeped in sound. This massive California chain store is one of three locations — the other two are in nearby Berkeley and Los Angeles — and offers endless exploring, with everything from new and used jazz on vinyl to the latest techno CDs, and even audio cassettes. There's a separate, smaller room for DVS and VHS tapes. Musicians and DJs occasionally perform live here as well, making Amoeba the ultimate one-stop music shop. Really want to immerse yourself in the Haight's cultural history? Take a walking tour. There are numerous options to choose from, and tours run the gamut from the hippie-themed Haight-Ashbury Flower Power Walking Tour to an audio tour narrated by actor and former activist Peter Coyote, who was at the center of the Haight-Ashbury's counterculture happenings. See Charles Manson's garage and the hideout house of newspaper heiress Patty Hearst during her time with the Symbionese Liberation Army (SLA), or embark on a food tour sampling some of the neighborhood's most diverse culinary offerings. You can even combine a couple tours and make a day of it. Another Haight-Ashbury spot that's been extremely popular since the '60s is Hippie Hill, a grassy slope on the east end of Golden Gate Park where '60s icons like Janis Joplin once hung out, and the Grateful Dead often performed impromptu jam sessions. Bring along a picnic blanket and join the crowds of hula hoopers and frisbee throwers. Hippie Hill is known for its elaborate drum circles, which can attract dozens of drummers — and plenty of people twirling to the music — on a sunny day. The people-watching here is spectacular, though expect a huge crowd (and a lot of smoke) on April 20, when Hippie Hill hosts the city's annual 420 Gathering. Between all the head shops, stores stocked with Tibetan rugs and wall-hangings, and used-clothing boutiques it's easy to spend hours perusing the wares along Haight Street. Some standouts include the always colorful Piedmont Boutique, known for its sparkling drag queen regalia and the fishnet-stockinged legs marking its entrance; the fedoras, floppys, and flatcaps of SF's own Goorin Bros. Hat Shop; and Loved to Death, with its taxidermied animals and resin skulls. There's also The Booksmith, a beloved community bookstore that hosts readings, book signings and book exchanges, both in store and across the street at their newer Bindery annex, where the titles are arranged by decade. One Sunday each June, throngs of revelers gather on Haight Street between Masonic and Stanyan streets for the neighborhood's annual Haight-Ashbury Street Fair, an annual tradition that began in the 1970s and has been going strong ever since. Closed to vehicular traffic, the stretch becomes a mass of wall-to-wall people who come to partake in the festivities. While you're there, dine on foods ranging from pad Thai to BBQ chicken legs, and peruse more than 200 vendor stalls selling hand-painted peace signs, Carnival-style party masks, and collectible Haight-Ashbury Street Fair posters. A rotating array of bands perform on stages at either end of the festival throughout the day. Though alcohol's been banned for years, if you're looking to imbibe Haight Street has plenty of places. The Haight is known for its diverse selection of food and drinks, from divey martini bars to gourmet gastropubs and cuisine that includes Thai, Indian, Mexican, Vietnamese, and Caribbean. Nothing along the street is too fancy, though if you've looking for food that's on the swanky side swing by The Alembic or Magnolia Brewing Co. If it's live music and a cocktail you're after, Club Deluxe and Milk Bar are go-to spots, while Cha Cha Cha is the perfect place for large groups, with lots of sharable tapas, and pitchers of sangria that go down fast.